24 Nov 2010 -- Out of my bunk at 5:05 am. Still dark. Can't see the lights of the Verrazano Bridge, which were clearly visible last night. Must be some fog up there. Made myself a good breakfast of hot oatmeal, boiled eggs, and an apple. Not sure when I'll have another chance to eat today. Sunrise supposed to be around 7 am, but I intend to be underway before 6. Hope I've left enough time to make Hell Gate before the tide turns. Before hitting my bunk last night, I'd carefully planned the day's voyage using all the information I had available. That included a cruising guide, a few iPhone apps that plotted tides and currents, several online bulletin board discussions on 'running Hell Gate', a complete set of paper charts, and an up-to-date copy of Eldridge Tide and Pilot Book. Even though I'm a computer guy, I must confess that I am not comfortable using computer apps as my sole source of navigation information. Long experience with computers tells me that 1) they are occasionally wrong (even NOAA warns about this) and, more importantly, 2) it is oh so easy to misinterpret them, particularly when you are tired. That is, computer systems are highly subject to operator error, even when the operator is an expert. So, like a good reporter, I like to confirm the story told by my computer with at least one non-computer source. That might sound redundant, or even paranoid to some, but confirming my navigation with a second source of data gives me an extra dose of confidence. And sometimes confidence in what you are doing makes all the difference in an emergency. There's nothing more dangerous than panicky second-guessing. In this situation, I had an excellent source of information in the form of the Eldridge Tide and Pilot Book. This book, ubiquitous on the northeast coast of the US, traces its roots back to the 1850s when George Eldridge self-published a Pilot for Vineyard Sound. At the time, the number of ships sailing through Vineyard and Nantucket Sounds was second only to the English Channel, and no other information was available. His son added tide and current tables (based on his own measurements) for the same area in the 1870s, and then gradually added coverage of tides and currents up and down the east coast. It quickly became the indispensable book for professional and amateur mariners on the east coast. My cruising guide and the folks on the computer bulletin boards agreed that the best time to start up the East River was 1 hour after low water at the Battery (right near the mouth of the river), or around 4:30 am. Since Hell Gate was approximately 6 nm up the river, that would put me in Hell Gate at around 5:30 am. That was the ideal. This went against all conventional wisdom, but it looked possible to me. Just one problem: Hell Gate was 24 nm from my anchorage in Sandy Hook. 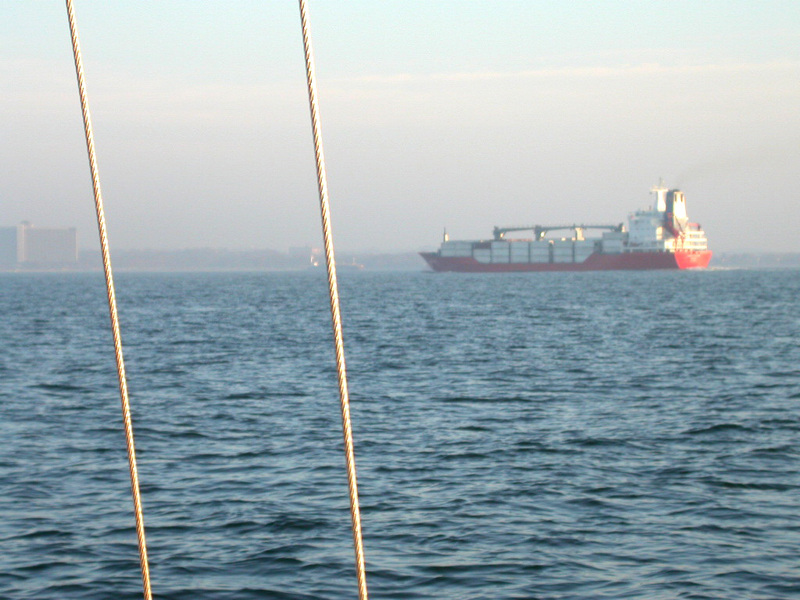 If I sailed at 6 am -- an hour before dawn -- I'd have to average 6 knots over the whole course to make it. The Blue Moon can only do 5.5 knots under her own power. To make it on time, I'd need some current behind me. Last night, that didn't seem a problem. I should have the current with me the whole way. Surely I'd average at least 6 knots. No problem. But in the cold dark morning, with a light northerly breeze already setting in, I started to worry. Would I make it? There was no place to anchor in the East River, or even in NY Harbor. If I didn't make it, it would be a long sail back to a safe anchorage. I had to make it. After a hurried breakfast of hot oatmeal, boiled eggs, and apple, I rigged my battery-powered array of running lights (small, battery powered LEDs clipped into my old brass sidelights, another LED hoisted to the masthead for a steaming light, and my cabin light slung over the stern), and steamed out of the anchorage just before 6 am. It was still dark and I remembered why I'd been reluctant to make an earlier start. I didn't mind picking out, with my flashlight, the numerous crab pots and flags in Sandy Hook Bay (what are all those flags for??? ), but I really wanted some light for crossing New York Harbor. According to all the cruising guides, New York Harbor was thick with barely submerged shipping containers, logs, and dead bodies. It sounded like a nautical obstacle course, and I wanted to be able to see what I was hitting. The 4 nm cruise up Sandy Hook Bay was quiet and easy. I had the whole bay to myself, except for a few die-hard fishermen and an ominous looking Coast Guard cutter that ran a slow, parallel course for a couple miles. You see these Homeland Security ships on patrol now in all big-ish US harbors. I'd even been stopped by one when entering a port from offshore in Florida. But today I was in a hurry and didn't want to stop for a chat. I double-checked my running lights to make sure they were in order, and held my course. After a while, the cutter seemed to lose interest. It veered off in another direction. But meanwhile, I'd been making just 5 knots. Not only did I not have the current with me, I seemed to have a 1/2 knot or so against me. 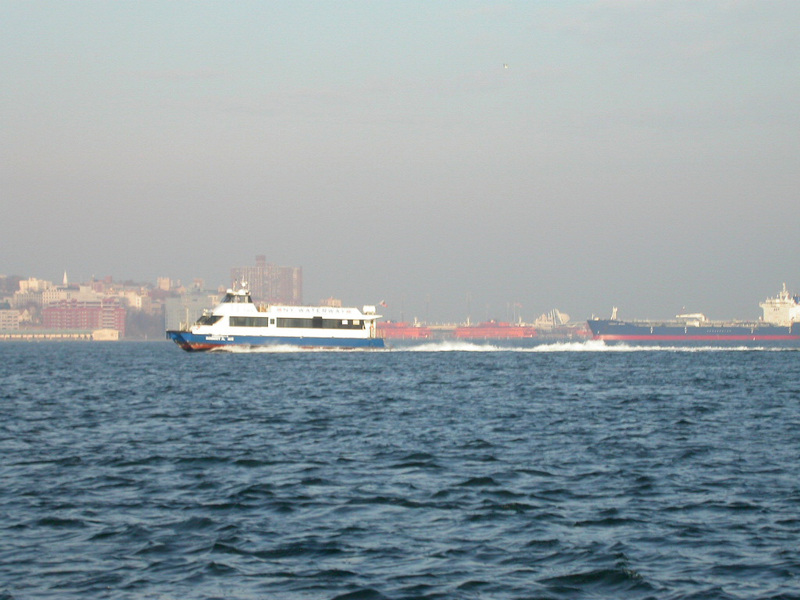 As I entered NY's Lower Bay, with young Dawn's rose-red fingers just showing in the east, I was behind schedule. 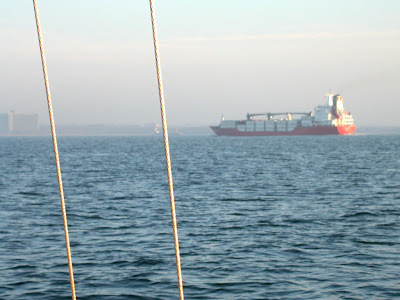 The 8 nm long Lower Bay is open to Atlantic swells from the east and criss-crossed with major big-ship traffic lanes with names like Swash Channel and Ambrose Channel. I followed the Chapel Hill Channel north, staying just outside the red buoys. This didn't seem to help. 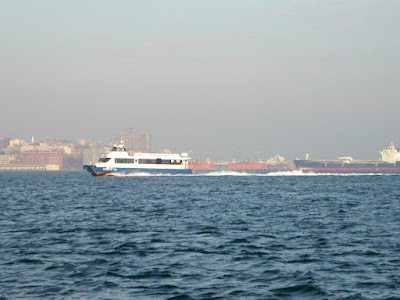 A steady stream of high-speed ferries buzzed back and forth between New York and New Jersey, and it didn't seem to matter whether I was in the channel or outside it. Wherever I was, they wanted to be. All the big-boy traffic seemed to be in the Ambrose Channel, which is the main connector between the Atlantic and the Upper Bay. I stayed well away from them, but still found their speed disconcerting. You'd look over your stern and see nothing; a few minutes later, there'd be a ship full of Toyotas or Wiis or whatever a mile away; in another few minutes, it would be past and out of sight. At least it seemed that fast. Half-way up the Bay, I still couldn't see the towers of the massive Verrazano Narrows Bridge that I was aiming for. The bridge -- and New York City beyond it -- were still hidden in fog. One of the terrors that bedeviled early sailors on the East River was fog. But, trusting that the fog would burn off before I arrived, I kept going. And finally it did retreat a bit to the north, revealing the bridge that I'd driven over so many times. I couldn't believe I'd soon be sailing underneath it. Verrazano Narrows Bridge finally emerging from the fog. 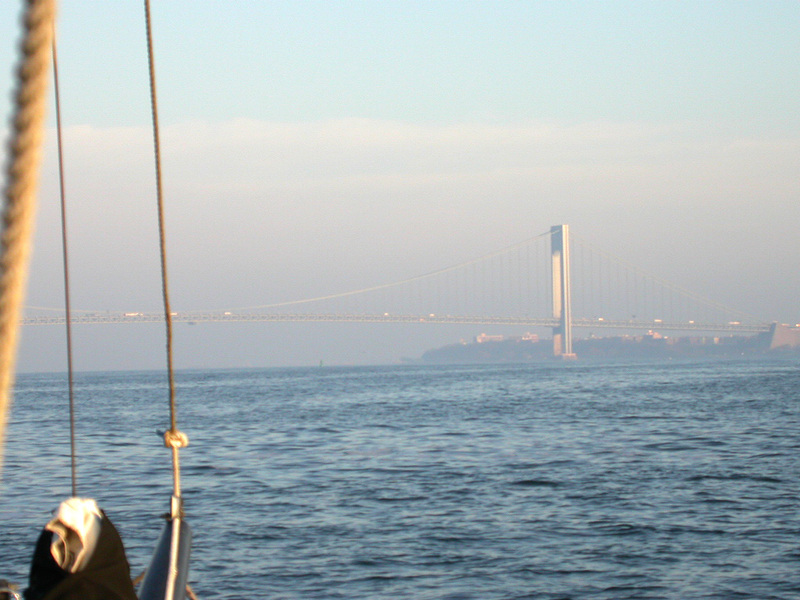 As the flood squeezed through the Narrows under the bridge, it picked up speed and as I passed under the Verrazano, we were finally making 6 knots. But by then we'd covered half the distance to Hell Gate. It was already 8:30, and we were well behind schedule. I'm torn John. Should I be upset that you are leaving me hanging under the Verrazano, or that maby you will soon be home. Ouch, ... 'to be continued' , darn, the suspense is difficult !! Ralph: that would be exciting. A bit *too* exciting in this weather! Think I'll stay inside, make some money, and work on Vintage in the evenings. Much more sensible! Sailandoar: Continued soon! Hopefully tomorrow. I wanted to finish it today, but I had to spend half the day digging out my driveway and the Blue Moon! John: Buy a snowblower. Your back will thank you. 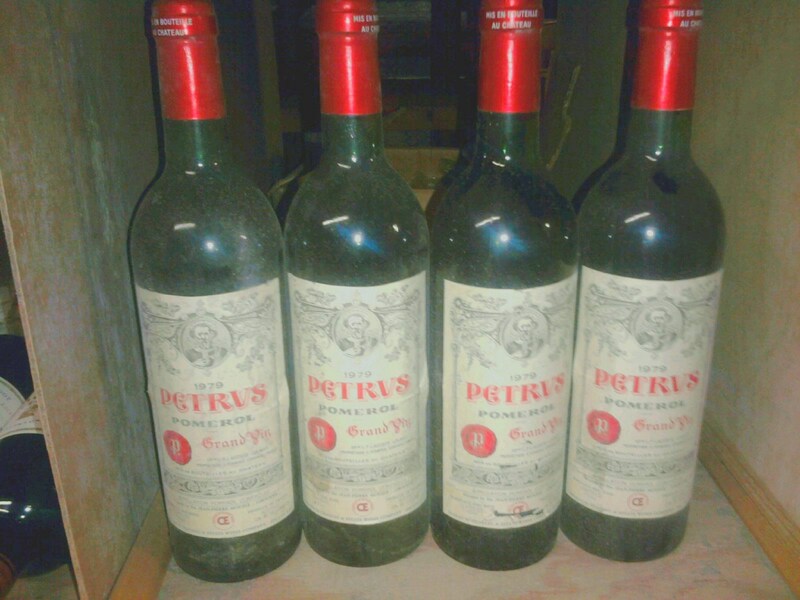 Did you say vintage? We must get together. tick tock, tick tock, too late, the ebb now carries us out beyond the Ambrose light. Ralph: What's Amstel Light got to do with anything? BTW, I need the snow machine. I'll be fifty in two weeks!